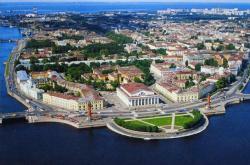 “Strelka” is the name given to the eastern tip of Va­silievsky Island. Vasilievsky Island is the largest of the islands in the Neva delta. The Neva breaks into two arms here: the Bolshaya (Big) Neva and the Malaya (Little) Neva. There was a port here until 1837 and for a long time this was one of the busiest parts of the city. The com­mercial port was situation here till the middle of the 19th century. In 1710's Peter the Great decided to make Vasiliev­sky Island the centre of his newly built capital. He or­dered a network of canals to be dug across the island in the fashion of Amsterdam. However, Peter’s plan was destined to fail. The building of the architectural ensemble of the Spit began in the first third of the 19th century. Outstand­ing architects took part in the creating of this beautiful ensemble. The Stock-Exchange was the first building erected here. It was designed by the architect Thomas de Thomon with the assistance of Andreyan Zakharov. It was placed strictly along the axis of the spit on a high open terrace. Forty-four powerful columns encircle the building almost concealing its walls. The foundation stone was laid in June 1805. The buil­ding was finished in 1816, but Thomas de Thomon didn’t live to see this day. The building is reminiscent of an Ancient Greek tem­ple. Over the main entrance facing the Spit there is the sculpture “Neptune Emerging from the Waves”. On the both sides of it you can see a sculpture of a young woman with a crown on her head representing the Neva River, and a sculpture of a man representing the River Volkhov. On the opposite side there is Mercury, the god of trade. The Stock Exchange now houses the Central Naval Museum. It was founded in 1709 by order of Peter the Great. The collection of the Central Naval Museum moved here from the Admiralty building in 1939. At the both sides of this building there were the ware­houses and the Customs House. They were designed by the architect Giovanni Lucini. Two warehouses were built symmetrically between 1826 and 1832. The goods delivered to the port were stored there. The warehous­es now accomodate the Zoological Institute, the Zoolog­ical Museum and the Central Soil Science Museum. At the same time as warehouses between 1829 and 1832 the building of the Customs was erected. Its pediment is crowned with the figures of Mercury — the God of trade, Neptune — the god of navigation and Ceres — the goddess of the harves. Now the former Customs House is occupied by the Institute of Russian Literature known as the Pushkin House. In front of the Stock Exchange the two Rostral Col­umns were installed between 1805 and 1810 after a project of Thomas de Thomon. The tradition of installing rostral columns as memorials symbolizing naval vic­tories goes back to Ancient Rome. In Rome the monu­ments of triumph were decorated with the bows of defeated ships. The height of each column is 32 metres. At the base of each column there are two allegorical figures of the Russian trade waterways: the Neva and the Volkhov, the Volga and the Dnieper. These figures were designed by the sculptors G. Thibault and I. Camberlain. The col­umns served as light-houses. The light pointing out the way for ships was switched on here. Tripod bowls were mounted at the top of each column. The bowls were filled with oil which was lit up in twilight. Nowadays, gas torches are lit above these columns during festivals.